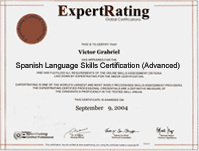 (leading to ExpertRating Spanish Language Skills Certification (Advanced)). Master your ability to speak, understand, and read Spanish by taking the final installment in our unique three-part Speed Spanish learning series. In this advanced-level course, you'll learn the final six recipes that will serve as templates to help you create any Spanish sentence you want. Guided practice will include lots of new vocabulary, pronunciation, and speed drills, as well as in-depth study of Spanish parts of speech to help you speak and understand Spanish in a snap. The goal of this course is not just learning the recipes—it’s also to help you use them spontaneously so that you’ll never be at a loss for words! An Introductory and Intermediate version of this course is also available. Any of these courses can be bought collectively or individually for $129.99 each. About the ExpertRating Online Spanish Course(III) instructor : Dan Mikels is a college instructor who has been teaching Spanish for more than 20 years. He holds a Master's degree and has authored and coauthored more than 20 educational products, including Speed Spanish, Fast French, and a variety of reading programs. Online Spanish Course requirements: For taking this instructor led ExpertRating Online Spanish Course(III) you need Completion of ExpertRating Online Introductory and Intermediate Spanish courses, Internet access, e-mail, and the Netscape or Firefox or Internet Explorer Web browser. ExpertRating is one of the world's only ISO 9001:2015 Certified companies (from TUV America) offering an Online Spanish (III) Course (leading to ExpertRating Spanish (III) Skills Certification). When you choose the ExpertRating Online Spanish Course(III) you can be sure that you are buying a premium International certification that is recognized by hundreds of employers and Government bodies in the US and other countries. With ExpertRating you get certified quickly online and you are equipped with a store house of information through the in-depth ExpertRating Online Spanish Course(III)ware which has been developed by experienced International Language Experts. The ExpertRating Online Spanish Language Skills Certification is by far the best value for money instructor led online Spanish Program at $129.99. You can buy this ExpertRating Online Spanish Course(III) leading to Spanish Language Skills certification (Advanced) at a special offer price of only $129.99 which includes the in-depthExpertRating Online Spanish Course(III)ware and exam fee. This is the best value for money Spanish Program available till date. You get the following services within the USD $129.99 fee. In-depth ExpertRating Online Spanish Course(III)ware including scenarios and case studies. The process of getting yourself certified is very simple. All you have to do is buy the ExpertRating Online Spanish Course(III) for $129.99. Log in to the instructor led course using your password. Go through the ExpertRating Online Spanish Course(III)ware (which would take you 6 weeks) and complete the final Spanish Certification exam at your convenience. You can complete the exam within 2 months of buying the Spanish Certification. The result of the exam appears as soon as it is completed, and your Spanish Certificate is mailed immediately. The final exam is fully based upon the ExpertRating Online Spanish Course(III)ware that is provided along with the Spanish Certification. If you have gone through the courseware properly you should not have a problem clearing the exam. 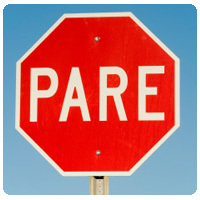 The exam consists of multiple choice questions from all chapters of the ExpertRating Online Spanish Course(III)ware. Spanish is the fourth most common language in the world. Spanish is an Indo-European, Romance language and is closely related to the other West Iberian Romance languages. Spanish and Portuguese share similar grammars and vocabulary and a lexical similarity of approximately 89%. 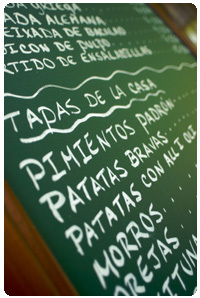 Spanish is one of the easiest foreign languages to learn. This Online Spanish course will teach you the basic rules, words, grammars and help you speak Spanish fast and fluently. The Online Spanish course would be useful to you if you are planning to work abroad, you plan to move to a Spanish speaking region or if you are interested in Spanish literature. The ExpertRating Online Spanish Certification (Advanced) gives you a rare chance to learn the nuances of the language and be fluent in it. There are many sounds in Spanish that one can’t find in English, so you'll start off your first lesson by practicing pronunciation. What's more, you'll practice Recipes 1 and 2, extending Recipe 2 so that you can express yourself better in the past tense. Once you finish this lesson, your pronunciation will have improved, and you'll know how to use Recipes 1 and 2 even better than before. Lesson 2 is a first introduction into what's usually referred to as the preterite tense. During this lesson and the ones that follow, you'll learn when and how to use the preterite and the imperfect when describing events that happened in the past, and you'll learn an assortment of time phrases that will help you reinforce your use of the past tense. When you're finished, you'll appreciate how the Spanish language carves up events and situations that have occurred in the past. Throughout the course, a review will be conducted regarding what you've learned in previous lessons, so in Lesson 3 you'll practice a number of recipes that'll look familiar to you. Working with these recipes, you'll learn what it takes to transition smoothly from one recipe to another. When you've completed this lesson, your speaking and writing skills will be more polished than ever before because you'll know how to use transitional phrases. The verb ser has peculiar verb forms, and in Lesson 4 you'll learn those different forms framed up against its partner verb, estar. After practicing this lesson's helpful drills, you'll know when to use ser and when to use estar. Once you've done this, your next step is to learn the Fun Phrases associated with ser and estar. You'll also practice Recipes 1 through 4 and learn some extended verb forms. After completing this lesson, you'll know all there is to know about Recipes 1 through 4! During the previous lessons, you've been learning and reviewing vocabulary while improving your pronunciation skills at the same time. This lesson is no different, but the focus in this lesson will be on distinguishing the preterite from the imperfect tenses. When you're finished with this lesson, you'll know the full range of Recipes 1 through 6, preterite and all. Lesson 6 will show you a few new verbs while reviewing Recipes 1 through 6. After that, this lesson will move on to an in-depth review of Recipe 7, which will give you options on how to package past events. Accompanying this lesson are practice drills designed to improve your ability to respond spontaneously in Spanish. You're now midway through the course, so you'll want to practice what you're learning here with native speakers of Spanish. Lesson 7 will go over the complete range of Recipe 7 and go through a few related exercises. You'll learn a number of commonly used short and crisp phrases that are associated with Recipe 7. You'll also learn how to apply Recipe 7 to hacer/dar/decir, verbs, which you need to know only because you'll be using them all the time. Besides learning more about Recipe 7, this lesson will also review Recipes 1 through 6. When you've completed this lesson, you'll feel comfortable using so-called irregular Spanish verbs, because you'll know the underlying pattern of these verbs. Spanish has flexible word order with some constraints, so in lesson 8 you'll learn how and when you can change the word order around. You'll review Recipe 8, which you learned in Speed Spanish II, and this lesson will introduce you to Recipe 9, which is called the Se Habla Español recipe. Later, you'll review reflexives, and then you'll learn some new ones and run them through a number of recipes. Because this lesson is chock-full of material, you'll be busy with fun! Remember in the first Speed Spanish course when you learned all about the particles, lo/la/me. Later in Speed Spanish II, they were expanded. Now you've made it all the way to Speed Spanish III, and it's time that you learn the full range of particle usages. You'll learn how to incorporate these new particles into your conversations and, as always, you'll practice all the recipes. Then you'll learn a host of new verbs that you can use in your everyday Spanish conversations. Lesson 10 will review the recipe that produces would verb phrases, and you'll learn its capacity to express probability. Besides learning more about Recipe 10, you'll learn a new recipe that will help you to express the future. This is Recipe 11. Because this lesson is building toward the subjunctive recipes, you'll also learn a number of phrases that can trigger the subjunctive. As is done in every lesson, you'll go over some new vocabulary words. This lesson will pay special attention to ser and ir, too. When you're finished, you'll have completed Recipes 10 and 11. The focus of this lesson, like all the others, is the recipes. In Lesson 11, you'll build on what you've learned in previous lessons by practicing Recipes 12 through 14. Laying the foundation for the subjunctive in the previous lesson, this lesson does the same and more so that you'll be prepared for the subjunctives recipes in Lesson 12. After you finish this lesson, you'll have learned Recipes 1 through 14. If you've ever heard the phrase, Viva Las Vegas, you've made the first step toward learning the subjunctive. In this lesson, framed up against the memories of Señor Macías, Platero, and David Smith, you'll learn the present and past subjunctives. After you finish this, the final lesson, you'll have learned a total of 17 recipes that should help you speak fluent Spanish! You now have the tools you need to read, write, and say whatever you want. It's up to you now to seek out Spanish speakers. May your recipes be with you!